MIAMI | While Congress and the nation focus on a permanent fix for DACA recipients, Catholic Legal Services continues a campaign to turn legal permanent residents into U.S. citizens. The archdiocesan agency and its partners will host a sixth Citizenship Mega Event Saturday, Feb. 10, from 9 a.m. to 2 p.m. at Miami Dade College’s InterAmerican Campus, 627 S.W. 27 Ave., Miami. 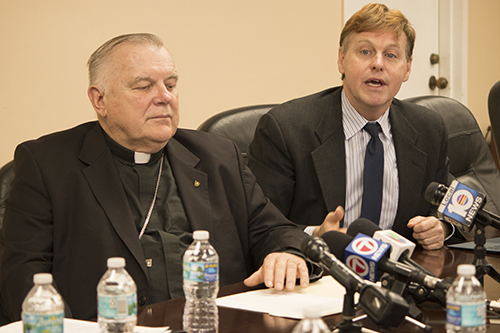 Randolph McGrorty, CEO of Catholic Legal Services of the Archdiocese of Miami, speaks to the press Nov. 22 regarding the termination of TPS for Haitians. Next to him is Archbishop Thomas Wenski. The event is part of — and funded by — the nationwide New Americans Campaign, which launched in 2012. NAC is a nonpartisan network of legal service providers who have come together to encourage and assist eligible legal permanent residents to become U.S. citizens. CLINIC — the Catholic Legal Immigration Network — is one of the partners in the New Americans Campaign. Catholic Legal Services is one of very few South Florida organizations that provide legal representation to impoverished immigrants seeking asylum, permanent residency and family reunification. Its 45 attorneys see about 3,000 people a month and process about 1,000 citizenship applications a year. He was referring to a previous mega event which drew more than 1,000 people to Marlins Park in 2016. This time, Catholic Legal Services is banking on technology to reduce the lines and wait times for applicants. Those with access to computers and the internet are asked to register at www.miaminac.org and begin filling out their citizenship application using an app called citizenshipworks. The app works like TurboTax, McGrorty said. As the applicants answer the questions, they are stopped if they fail to meet any of the criteria for citizenship. Those who do meet the requirements will have completed about 95 percent of the application before the Citizenship Mega event. They will be fast-tracked onto a line where their paperwork will be given a final review by an immigration lawyer. “You have a free attorney that day to take a look at your application,” said Ana Quiros, managing attorney for Catholic Legal Services. The only thing prospective citizens will need to do after leaving the mega event is submit their paperwork — along with the $725 application fee owed to the U.S. government — and wait for the next step in the process. Typically, that’s an in-person interview with an immigration official to ascertain, among other things, that the applicant speaks and writes basic English and can answer a series of civics questions. Another incentive is the rising cost of applying. It was $680 in 2013, when the first New Americans Campaign citizenship event took place in Miami. The fee can be reduced to $405 for persons receiving public assistance, and staff from Florida’s Department of Children and Families will be on hand Feb. 10 to provide letters to that effect. Registration is required for the Citizenship Mega Event. Those without access to a computer can do so by calling Catholic Legal Services at 786-708-2115. Friday, Jan. 26, 7-7:30 p.m.
Tuesday, Jan. 30, 7-7:30 p.m.
Wednesday, Jan. 31, 7-7:30 p.m. While citizenship is the focus of the Feb. 10 event, help also will be available for those who are not eligible because they are not legal permanent residents. “We’re going to send them over to IMPAC so they can get a legal consultation right there,” said Quiros. IMPAC is the Immigration Partnership and Coalition Fund, a newly-formed, pro-immigration coalition of South Florida civic and business leaders, whose mission is to give undocumented immigrants the proper legal advice and enable families to stay together. IMPAC sponsors Know Your Rights presentations, gives free legal consultations and in some cases, provides attorneys to represent people in immigration court. McGrorty said the statistics nationwide for these citizenship mega events are very encouraging. More than 90 percent of applicants follow through with the process and eventually get sworn in as citizens. Catholic Legal Services is also looking for volunteers to work the Feb. 10 event: everyone from immigration attorneys to attorneys with other specialties, paralegals, and people with no legal background who simply want to provide hospitality and guide applicants around the venue. Friday, Jan. 26, 5-7 p.m.
Tuesday, Jan. 30, 5-7 p.m.
Wednesday, Jan. 31, 5-7 p.m.
Another training session will take place the day of the citizenship event, Saturday, Feb. 10, beginning at 8 a.m. at MDC’s InterAmerican Campus. This article has been corrected to reflect the fact that Catholic Legal Services is not the only organization in South Florida that provides legal representation to impoverished immigrants. You can bring family members such as spouses, children, parents and siblings to the U.S.
You can apply for federal government jobs.